Downloading an app might seem like a simple task, but a lot of mobile users take it more seriously than you think - especially when it comes to reviews. In fact, 77% of people read at least one review before they choose to add another app to their collection, with a further 13% reading at least seven before making a decision. Basically, those little yellow stars are important. How do you get good reviews? by listening and communicating with your users. Thankfully, both Apple and Google now let you do that by replying to reviews. Replying builds trust and engages your users, which in the long run leads to more downloads. It’s pretty important. Providing great customer support isn’t easy, and in some cases can feel overwhelming and even daunting. To help alleviate the stress we put together a simple guide with tips to help you master your reply game. No one wants to be ignored. If a review goes unanswered, it signals disinterest and a lack of caring. Respond promptly—ideally, within a few hours but no more than a day. FYI - with review alerts you’ll get an email, Slack message, or a push notification when a new review is written, and can reply immediately. Take the time to fully read the review before starting to type. You won’t earn any points for being speedy if your reply totally misses what the review is about. Reviewers take to the store when they’re either extremely happy or really frustrated. More so the latter. Think about that when replying, and reply in a way that shows you understand their frustration and will try your best to help. Write your replies in a style that fits your brand. Are you casual? funny? articulate? Whether you’re an indie developer or have a dedicated support team, you have a voice that you use on your website, app description, etc. Use that same voice and be consistent when replying. We at Appfigures reply in a casual tone, as if we're talking to a colleague. If you haven’t figured out your voice just yet, check out this guide from the guys at Sprout Social. Don't use canned responses. This might sound controversial, but we feel strongly about it. Your reviewers are people, too. To make sure that they feel the personal connection write each response from scratch. They will always know. Forgo the extra pleasantries and get right to the point. Just answer the question or address the concern the review is about. Avoid the use of negative words. 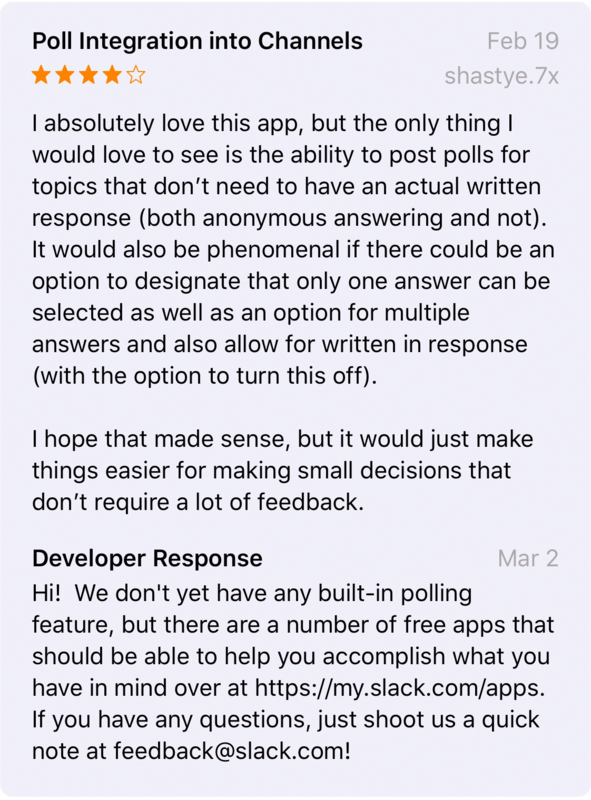 After all, you are often trying to restore the reviewer’s faith in your app. We’re not saying be a bubbly cheerleader, but also not a Debbie Downer. Skip words like unfortunately, can’t, impossible, never, etc. ; instead, accentuate the positive. This one’s a hard requirement! Take the time to write replies that are grammatically correct and don’t have any typos. This grammar cheat sheet from the folks at HubSpot has all the basics covered. Whether you're replying to a technical issue, a feature request, or just a rant, remember to speak honestly. 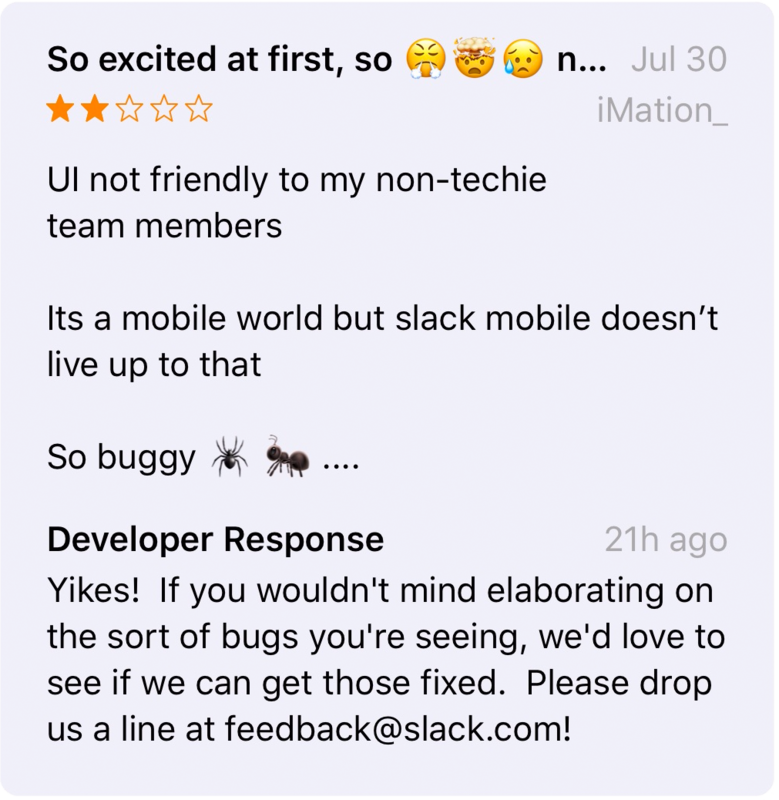 If the user encountered a bug you think is silly, say it. If a feature is requested, let the user know when (and if) it'll be available. If it won't be, explain why. Try to be realistic and don't overpromise. There’s a common misconception that saying sorry makes users feel better. It doesn’t. If anything it’s the opposite. Only apologize in cases where a true apology is necessary. If a user misunderstood your clearly described feature don’t apologize for that. If your pricing isn’t clear however you should apologize for the confusion (and fix it). Some reviews can’t be resolved with a single reply. For cases where more information is needed or where a followup would be helpful, offer a direct channel to be reached at. The easiest and most common one is email. If you go that route, make sure you have a professional email with a custom domain. This one should be common sense, but we know from experience it isn’t. Remember the goal of replying is building trust. Replying in anger doesn’t achieve that. If you're feeling the anger rise, don't reply and instead leave it alone for a bit. Come back to it later after you've cooled down and then reply. It won't hurt running your reply by a friend or a colleague to make sure it's got the right tone. Lastly, don’t forget to acknowledge reviewers that said positive things. Show them your appreciation by saying thanks. It can’t hurt. People are craving human connections more than ever, despite the large majority of our days spent staring into little flat screens. Because of this, users want to see your human side. It’s up to you as the developer to cultivate a positive experience in your reviews section, and it’s your responsibility to maintain a professional, happy, and human dialogue. 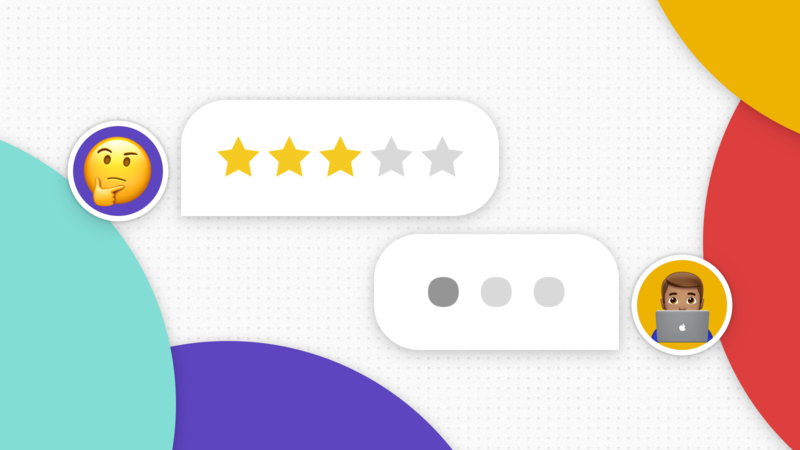 Remember: your reviews section is one of the first things potential users will see, and building it into a powerhouse of praise and trust is one of the best things you can do for your number of downloads and your position in the app store. Everything you need to know about all of your apps in one place. Access in-depth data for millions of apps with advanced search and real-time alerts.